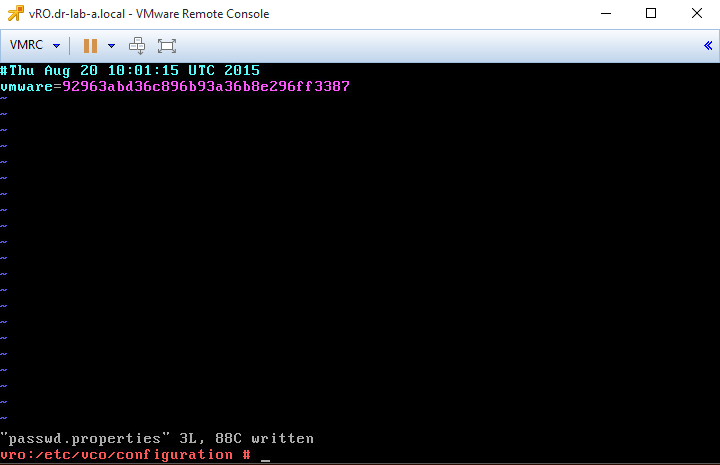 Anyway, I locked myself off and I cannot open the vRealize Orchestrator configuration page. Here is a quick procedure that will recover vRealize Orchestrator password. Please note that this procedure is intended to recover the vRealize Orchestrator password on the appliance version. Open the vRO appliance and log in with the root user. Next, enter this exact phase (92963abd36c896b93a36b8e296ff3387) after the vmware= string. This will be the default password “vmware”. Press the ESC and type :wq! to save and exit the file. Open your web browser and navigate to the vRO configuration page. Log in with password “vmware” and change the password as prompted. You should now be able to open the vRO configuration page. You can also remove the passwd.properties.old file now. that’s the one you set up during the OVF deployment if I am not mistaken.